The CoreLogic Home Value Index recorded a recovery from the 1.1% fall in May, with a 1.8% rise in capital city dwelling values over the month of June. “This stronger month-on-month reading can be partially explained by the seasonality in the monthly growth rates," CoreLogic Head of Research Tim Lawless said. The June quarter results showed that capital city dwelling values were 0.8% higher across the combined capitals index; the slowest quarterly rate of growth since December 2015 when the combined capitals index fell by 1.4%. “This trend towards lower capital gains across the combined capitals index is mostly attributable to softer conditions across the Sydney housing market, where quarter-on-quarter growth was recorded at 0.8% over the June quarter; down from 5.0% over the March quarter," Mr Lawless said. For Sydney, Mr Lawless said the more pronounced slowdown is supported by weaker auction clearance rates which have been tracking in the high 60% range across the city over the last three weeks of June, while in Melbourne, clearance rates have moderated but remained above 70%. Across the combined capitals, the annual pace of capital gains eased from 12.9% three months ago to 9.6% at the end of June 2017. Sydney’s annual growth rate slowed to 12.2% over the twelve months ending June 2017, down from a recent high of 18.9% three months ago. Melbourne’s annual growth rate is now the highest of any capital city, surpassing Sydney’s annual rate of growth despite easing from 15.9% three months ago, to 13.7% over the twelve months ending June 2017. 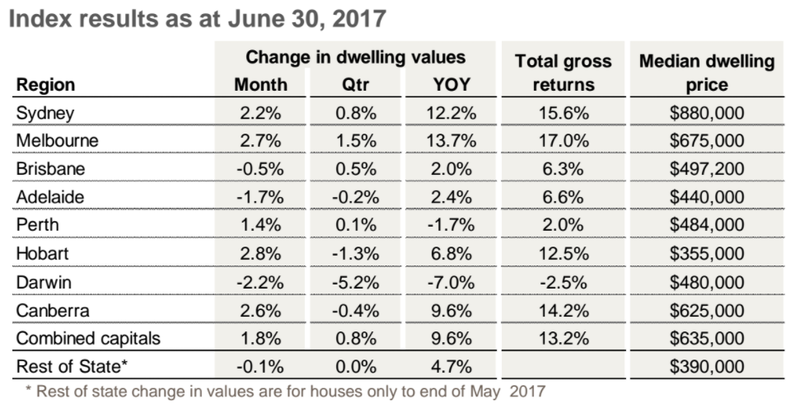 Brisbane now has the third highest quarterly pace of capital gains with dwelling values 0.5% higher over the June quarter. Brisbane’s growth is entirely attributable to a 0.8% rise in house values which offset a 2.4% fall in unit values over the quarter. 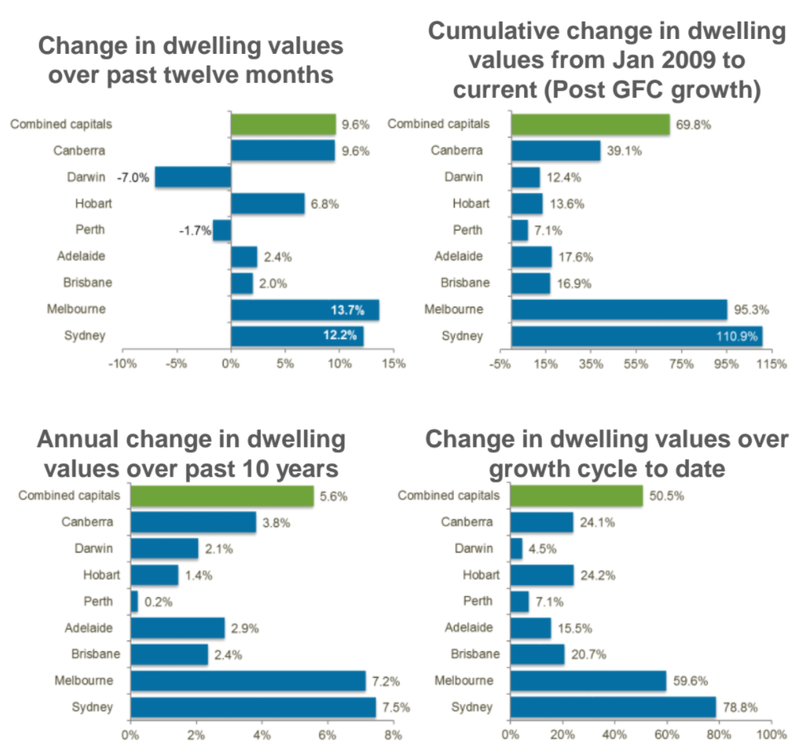 Dwelling values slipped lower across the remaining capital cities, except Perth, which posted virtually flat growth conditions (+0.1%) over the June quarter. The change in rental growth conditions is most noticeable in Canberra and Hobart, where rents are respectively increasing at 8.4% and 6.2% per annum, however Sydney and Melbourne rental markets have also seen a turnaround in what was previously a sluggish rental market. Rents in both cities are 4.5% and 4.1% higher over the past twelve months. The growth in rents can be attributed to the ongoing significant rate of net migration into New South Wales and Victoria. “While the rental growth turnaround will be welcomed by landlords looking to recover higher mortgage costs, the consequence is that renters are now facing renewed pressure as rents rise," Mr Lawless said,. In Perth and Darwin, rental conditions remain subdued, falling by 8.3% and 5.4% respectively over the year, while Brisbane rents slipped 0.2% lower and Adelaide rents held reasonably firm, up 1.1%. Despite the higher pace of rental growth in some cities, dwelling values rose at a faster pace over the year, resulting in a further compression of rental yields. 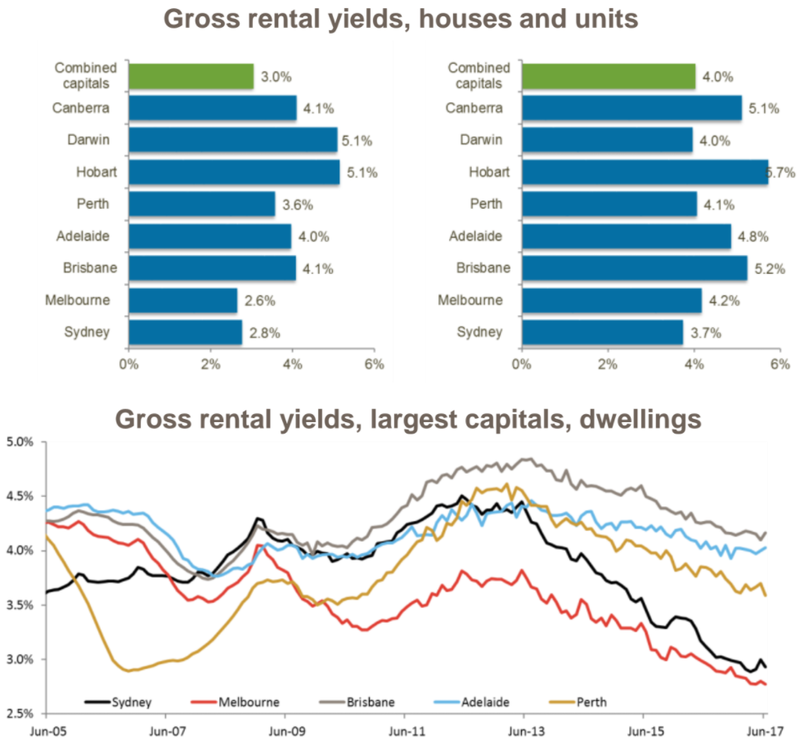 Gross rental yields are now 20 basis points lower than one year ago across the combined capital cities and tracking at a record-low in Melbourne, and close to record lows for Sydney. Mr Lawless said it was likely that landlords will be seeking to recover some, or all, of their increased financing costs associated with higher interest rates on investment in interest only loans by progressively increasing weekly rents. "With record-low wages growth and so much new housing supply coming to market, this remains to be seen," he said. “Although growth conditions have lost momentum across the largest housing markets, we are yet to see any signs of a material downturn. "The key drivers for a slowdown have been gradual. They include mortgage rates pushing higher despite a steady cash rate, lender credit policies tightening up and housing affordability - which remains a significant barrier for many prospective buyers. "Additionally, higher supply levels in the unit market appear to be creating a drag on the performance of the unit sector in specific segments," he said. 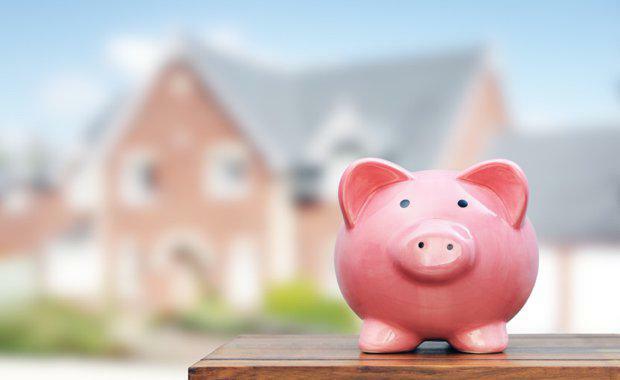 “The impact of macroprudential measures announced by APRA at the end of March are still flowing through to mortgage rates and credit policies. "We are likely to see further tightening and repricing around investment lending and interest only lending over the coming months,” Mr Lawless said. The latest credit aggregates data from the RBA showed a further slowing in investor credit during May, after growth peaked in December last year. “Considering investors comprised just over 55% of new mortgage demand across New South Wales, based on the latest housing finance data from the Australian Bureau of Statistics, a further slowdown in investment activity is likely to have a more substantial impact on housing demand in Sydney relative to other markets," Mr Lawless said. Westpac and the Melbourne Institute have reported a further reduction in their widely followed consumer sentiment index. The ‘time to buy a dwelling index’, remained close to seven year lows, indicating that consumers are viewing the housing market with a more pessimistic mind set. Despite the range of softening indicators, mortgage demand remained strong across May and June, tracking roughly 3% lower than the same period in 2016 based on mortgage related activity from lenders across CoreLogic valuation platforms. “The reasonably steady level of valuation events suggest buyers remain active, despite higher mortgage rates, and are potentially shopping around as credit conditions tighten," Mr Lawless said. “Wages growth is tracking at record lows, and mortgage rates are likely to rise further, particularly for investment purposes.